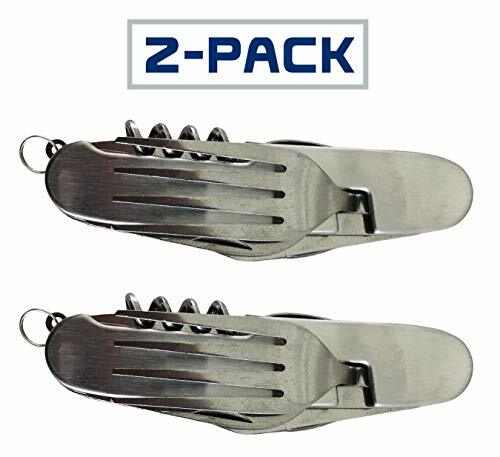 2 Pack Stainless Steel multi-function tool includes fork, spoon, knife, wine opener, bottle opener and can opener. his eating utensil set is lightweight great for boating, camping, backpacking, hiking, survival, and fishing. Its separating design allows you to use fork and spoon separate from each other, much better than using flimsy plastic cutlery. The stainless steel makes it easy to clean, strong, durable for years to come. Click "Add to Cart" now. 2 Pack Stainless Steel multi-function tool includes fork, spoon, knife, wine opener, bottle opener and can opener . CUSTOMER GUARANTEE - At Typhon east, we believe in old-fashioned service and quality. If you are dissatisfied with your purchase in any way, please reach out to us and we will gladly issue a full refund.